We are part of the Digital Economy CDT Network, that supports and develops training activities for postgraduate research students. In early February we were delighted to attend the annual meeting, showcase and careers symposium held at the Digital Catapult, London. Day 1 was characterised by fruitful and engaging discussions about the range of training activities and support DEN offers and could offer it student members. Attendees eagerly awaited news about the Summer School 2018, being hosted this year by the Centre for Digital Entertainment and with topics such as AI and machine learning on the agenda it was clear this year’s event was going to draw a big crowd. Day 1 concluded with a CDT showcase, allowing the member CDT’s to demonstrate the quality and quantity of research taking place at their centres and for the researchers to find out more about their peers across the UK. A particular highlight was the VR game simulation from the IGGI CDT team! Careers was the focus of the following day and saw guest speakers, all who were alumni from CDT members of DEN. Each speaker shared their career journey, the decisions, complications and successes achieved along the way. There were speakers from academia and industry with both SME’s and large enterprises represented. 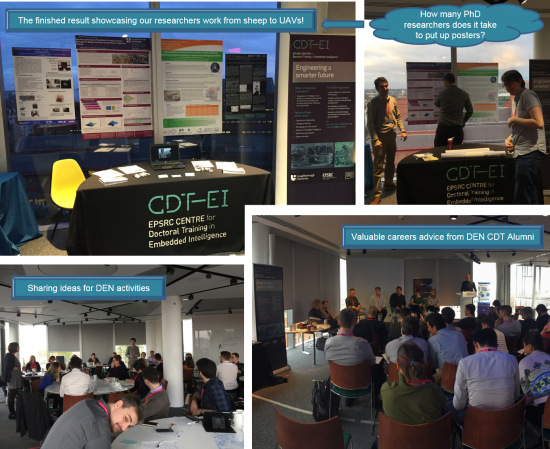 The talks gave a realistic insight to what lies on the other side of the PhD thesis and each speaker shared their thoughts on what a doing a PhD in a CDT has meant to them and what they would do differently (finishing the writing process before getting a job was a reoccurring theme!). Cohort 1 researcher Adrian Ayastuy Rodriguez had the opportunity to meet HRH The Princess Royal and speak to her about his research during her recent visit to his co-sponsoring company, Moredun. The special visit was the celebrate Moreduns partnership with the farming industry. More details about the visit can be found on Moredun website. 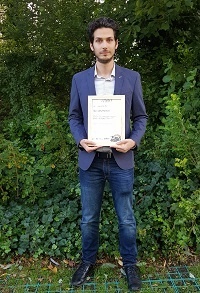 Congratulations to MicroSense Technologies Ltd, led by Prof. Desmulliez and Dr. Flynn from the CDT-EI at Heriot-Watt University who have been included as one of the “Five rising stars of Scotland's tech start-up scene which could be the next Skyscanner". The European Safety & Reliability Conference took place from Monday 19th June 2017 to 22nd June 2017 in Portorož, Slovenia. This conference focusses on a wide variety of topics related to safety and reliability. In its 27th iteration this conference attracted many academic and industry delegates from around the world, including numerous delegates from outside the European Union. 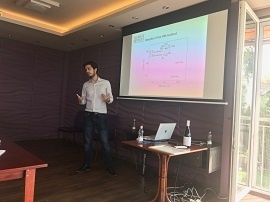 The conference was attended by Darius Roman & Ross Dickie from Cohort 3 of the Centre for Doctoral Training in Embedded Intelligence who presented their paper entitled “A Review of the Role of Prognostics in Predicting the Remaining Useful Life of Assets". This is a paper which highlights case studies from their field of Prognostics and Health Management and illustrates the distinctions between data-driven and model-based prognostics and discusses the blending of these approaches through so-called fusion prognostic methods. Their work uses the case studies to highlight features of these distinct prognostic methods. The work was presented in the afternoon of the first day of the conference as the first presentation in the afternoon parallel session “Prognostics & Health Management 2", as a review paper this provided a good framing and context for the work subsequent presentations within the session. The experience at ESREL gave Darius and Ross an opportunity not only to showcase their work in an international setting, first-hand but also the opportunity to gain exposure across both the industrial and academic worlds due to the mixing provided in this conference. The conference also provided the researchers an opportunity to learn about cutting edge work in their field and discuss their work with a diverse group of delegates within the conference.